Dr. Reider has expertise in the design and conduct of multi-center clinical trials and health services research in orthopaedic trauma and gerontology. Her work has focused primarily on 1) measuring outcomes following orthopaedic trauma; 2) evaluating the effects of aging, pharmacologic treatments, diet and exercise on skeletal fragility; and 3) evaluating new models of care for multi-morbid older adults. 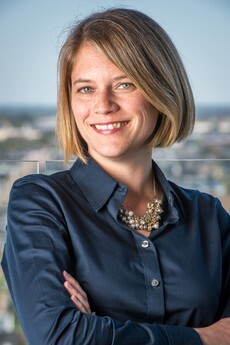 She is the Associate Director for the Coordinating Center of the Major Extremity Trauma and Rehabilitation Consortium (METRC), a network of over 30 hospitals conducting large prospective studies aimed to improve the clinical, functional, and quality of life outcomes following severe lower extremity injury. Person in Training Award from the Health Sciences Section of the Gerontological Society of America, 2011. The following publications reflect the different areas of research that I have been involved in. Manson T, Reider L, O’Toole RV, Scharfstein DO, Tornetta III P, Gary JL. (2016) Variation in Treatment of Displaced Geriatric Acetabular Fractures Among 15 Level I Trauma Centers. Journal of Orthopaedic Trauma. 30(9):457-62. Reider L, Beck TJ, Alley D, Miller R, Shardell M, Schumacher J, Magaziner J, Cawthon P, Barbour K, Harris T. (2015) Evaluating the Relationship between Muscle and Bone Modeling Response in Older Adults. Bone. 90:152-8. Bosse MJ, Teague D, Reider L, Gary JL, Morshed S, MD, Seymour RB, Toledano J,Cannada L, Steverson B, Scharfstein DO, Luly J, MacKenzie EJ and METRC. (2017) Outcomes Following Severe Distal Tibia, Ankle, and/or Foot Trauma: Comparison of Limb Salvage vs. Transtibial Amputation (OUTLET). J Orthop Trauma. Suppl 1:S48-S55. Reider L, Hawkes W, Hebel JR, D’Adamo C, Magaziner J, Miller R, Orwig D, Alley DE. (2013). The association between body mass index, weight loss and physical function in the year following a hip fracture. J Nutr Health Aging. 17(1):91-5. Boult C, Reider L, Leff B, Frick KD, Boyd CM, Wolff JL, Frey K, Karm L, Wegener ST, Mroz T, Scharfstein DO. (2011) The Effect of Guided Care Teams on the Use of Health Services: Results from a Cluster-Randomized Controlled Trial. Arch Intern Med. 171(5):460-6.